Chanteuse Country et Rockabilly US née le 10 Septembre 1950 à San Antonio (Texas). Alternative country meets the rockabilly revival meets California guitar virtuosity in the music of Rosie Flores. 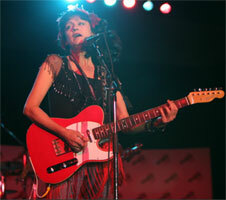 Since the late '70s, guitarist, singer, and songwriter Rosie Flores has been an important figure on the alternative country scene in both Austin, TX, and Los Angeles. She's a hard-working, independently minded artist who's well-respected for her gritty, energetic Vocalss and fiery guitar solos. A native of San Antonio, Flores moved to San Diego with her family when she was 12. Her family encouraged her singing and guitar playing, and as a girl she soaked up the sounds of southern California -- surf guitar, country and country-rock, blues, and rockabilly-flavored garage rock. By the time she was in her teens, Flores was playing in a band called Penelope's Children. During the first explosion of punk rock in the late '70s Flores formed Rosie & the Screamers, an otherwise all-male band that played hard country and rockabilly material, much of it written by Flores herself. She worked as a solo acoustic artist for a time but then formed an all-female punk band, the Screaming Sirens, who recorded the album Fiesta in 1984. After a short hiatus, in 2009, Flores celebrated over two decades of recording with Girl of the Century, an album recorded with the Mekons' Jon Langford and the Pine Valley Cosmonauts for Bloodshot Records. Her raucous 11th album, Working Girl's Guitar, which appeared in 2012, was the first in which she handled all the production and guitar leads herself. With 2019's Simple Case of the Blues, Flores put the focus on her love of blues and vintage R&B, covering classic tunes by Wilson Pickett and Roy Brown along with a fresh batch of originals steeped in the classic styles. When not on the road, Flores gigs regularly in Austin, Texas with the Blue Moon Jazz Quartet as well as her more roots-oriented project the Rhythm Rockers.